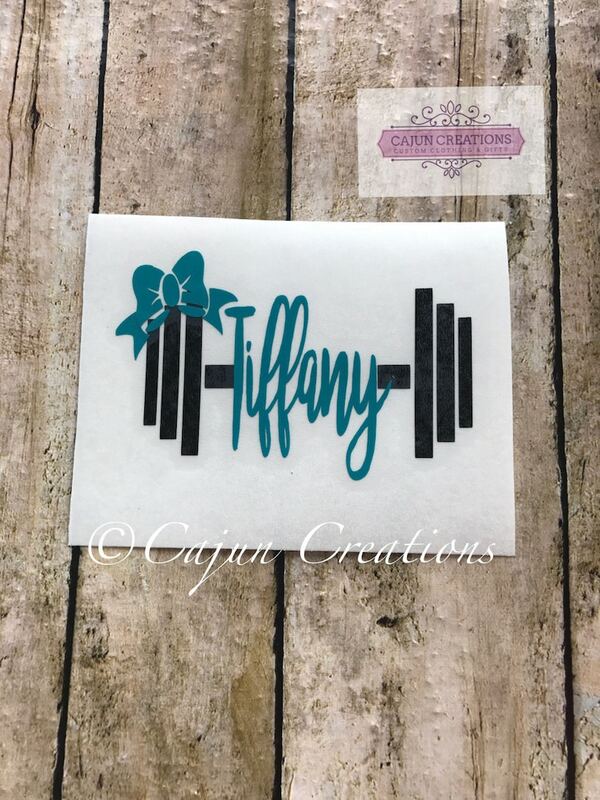 Gym decal, Personalized weight with bow, fitness decal, crossfit decal. -Weight name decal with bow. -Decal is made from high quality, professional grade vinyl. -Please double check spelling, name will be applied exactly as it received. -No refund due to customer's error of sending spelling incorrectly. -Choose your monogram/bow color from the drop down box. -Choose your decal size from the drop down box. -Weight design comes standard in black. If you would like to use a different color please include that in the "NOTE TO SELLER" section. -When choosing the decal size you are choosing the size of the longest side of the decal. -Please keep in mind that the colors may slightly vary due to differnt monitor screens. -The vinyl used for the decal is NOT recommend to be used on walls, rubber, silcone, or PCU cases. -We strive to create items that you will love. -Our customers are very important to use. -If you have any questions or concerns please don't hesitate to message us. This decal was a gift and she loved it! Thank you! Not the best picture, but we loved the shirts!